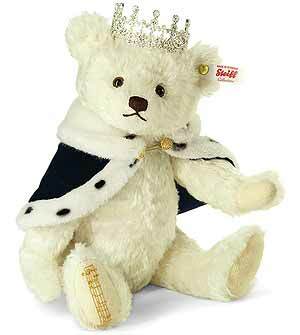 Queen Elizabeth Musical Teddy Bear by Steiff. This beautiful hand made piece, in white mohair, is fully jointed and wears the white ear tag, signifying this item as a Steiff limited edition, together with the famous gold plated Button in Ear. Limited edition of only 2015 pieces for the UK and Ireland. Product details: safety eyes, synthetic filling material, features turn key music box, size 30cm. Comes boxed, together with a numbered certificate of authenticity. This Steiff bear embraces Elizabeth II becoming the longest reigning Monarch in British history and demonstrates how this important event casts in a new light over the British National Anthem´s prayer about a Queen who is "long to reign over us". Her stunning crown and regal coronation robe add splendour to this majestic bear who´s heart beat plays the British National Anthem dating back to the eighteenth century - "God Save the Queen"